These days, even with books still in print, there are too many different ways to read. I never grew up with e-books, or audio books quite frankly. Now, these two formats are hard to avoid. They are cheap, convenient, and widely available. Of course bookstores are still around; children running around with new toys, or trying to listen to story time; students taking all the available seats, and the floor, too! ; adults stroll; with cafes in store, people settle and read magazines. Then, there are advertisements for Nook books, Kobo books at independent bookstores like the one I once worked at. You can browse the limited audio book sections. More people are listening to audio books. I am constantly seeing e-readers. I admit I have one, but the power dwindles more than I turn the fake pages. The one format I am having trouble grasping is audio books. I admit to getting joy of finding great and cheap reads on my Nook. For each gift card, I stretch it out by only getting $2.99 or less books. I have learned to stay away from free, google copied classics. I rather buy a new book than buy it on my Nook. I don’t like that the prices don’t differ as much. You would think with ink being limited, trees untouched, the price would be lower. But, audio books, I have passed on. I have only read a few audio books. Often though, you will hear my music seeping from my headphones rather than hearing unfamiliar voices speaking Dickenese, Austenian, or any other dialect. When I clean, which isn’t too often, I still choose music. Why, because I don’t want to not hear a novel. I can’t concentrate and focus on the words being spoken. I try to listen to The Wind in the Willows, but it has taken me around six months, or so, to reach chapter nine. What happened during the book, I just don’t know. I can’t quite remember because I don’t think my brain was really listening. But, I have discovered my problem, narrators! I am listening to The Secret Garden by Frances Hodgson Burnett and absolutely love the narrator! I am enjoying it so much I forget I am listening to it, instead I feel present with the narrator. Other works I have listened to, I just didn’t like the voice speaking to me. When I listened to Peter Pan, a librivox recording, the narrators switched; a new voice each chapter, but not for each character. For all you audio book fans, what makes an audio book work for you? And, what format do you really enjoy? I know audio books are not for all, but now I think I will give them a second chance. Unfortunately, I am on a budget, I only listen to the books featured on the 99 cent app on my Iphone and Itouch. Who can pass up unlimited audio books with a one time fee of 99 cents plus tax? 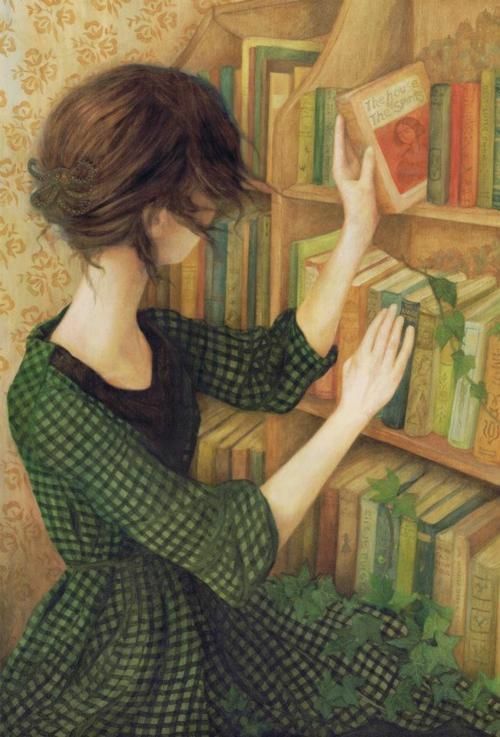 Feeling a book is great. But I have no more room for books. My library is terrible. Audio books just be something I want to keep as a major option. I like audio! I an fairly new to it – about three years but now I am addicted. Of course you need good audio and I don’t sit and listen – I listen to it while I get ready in the morning on my IPOD while mowing the lawn, cleaning, etc. I recommend for you Ready Player One – it was fantastic – on and anything by John Green – Fault In Our Starts made me cry! I loved The Fault in Our Stars! I read it and it made me cry. “Okay.” “Okay.” So great. I looked at Ready Player One, but didn’t catch my eye the way I wanted it to. Maybe I will look again. That quote is so true! 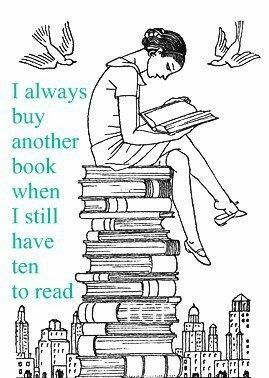 I have about three I currently am reading and still buying up a storm! It is addicting. Even e-book purchasing. I see $2.99 books and I’m like I can afford that. My whole desk has about 30 books toppling over. And I almost bought three or so books recently. New books need to stop coming out. Seriously!! Those e-books have been what’s been getting me lately too. Right now I’m on ‘The Chocolate Money’, ‘If You Have To Cry, Go Outside’, and ‘Son of a Witch’. I also need to start and finish all of the ‘Hunger Games’. I wanted to read “If You Have to Cry, Go Outside”. How is it? Did you ever watch her show on bravo? It was great. The Hunger Games were great and a fast read. Won’t take you too long to get through them. Is Son if a Witch worth reading? It is just long. Wicked was good, but some parts could have been cut. Been a long time since I read it. I am reading Havisham by Robert Frame on paperback, The Merry Adventures of Robin Hood on audio, and Ruby Red on my nook. Whew. It’s better than expected, I love it! It’s more of her comeup story versus a how to but it’s pretty interesting and inspiring. Yes I loved her show, and her appearances on ‘The Hills’. Meh ‘Son of a Witch’ is okay, hard to stay focused on it–‘Wicked’ is much better. Nice!–I have to look into those, which one are you loving the most?